Your car means the world to you, whether it be a classic, race car, supercar or family heirloom. If it needs to get from A to B, you’ll understandably want to ensure it does so safely and that it arrives in the same condition in which it departed. At Circuit2Circuit, we’ve spent many years providing covered car transport to ensure our customers prides and joy get to where they need to be on time and in perfect condition. Our team travels across the world to collect and deliver cars with our covered transport service. Our Facebook page offers a glimpse at the many varied locations we visit, but you’ll spot that we will literally travel virtually anywhere if it means getting your car where to it needs to be safely. When booking a firm to transport your precious car, would you want to leave it in the hands of a team that puts profit before the safety of your vehicle? Of course not - you’d want a team of like-minded enthusiasts who will treat your car as though it was their own. The Circuit2Circuit team will do just that; your car really couldn’t be in better hands. We want to offer all of the customers who use our covered car transport service ultimate peace of mind. This is why we include full insurance for every trip, no matter the distance or location. This is absolutely the best and most cost-effective way to ensure your car is transported to its eventual destination safely. Lots of our customers require much more than covered car transport. Set in the heart of rural Northamptonshire, our 100%-secure, climate-controlled car storage facility is the perfect partner for our transport service. If you need long- or short-term storage for your car, we’ll collect it, store it (and look after it while there) and return it to your doorstep. That’s one phone call, and one passionate team to do everything for your car. It really doesn’t matter how far your car needs to travel in our covered transport unit - the Circuit2Circuit team will dutifully take on any challenge thrown at them. We’ve spent years delivering classic cars, race cars and supercars to all manner of challenging locations, therefore we’ll always say “yes” when you request a lift for your precious motor! If you’d like to discuss the options for covered car transport, we’d love to hear from you. Our friendly team will answer any queries you might have and work with you to arrange the most convenient time for you to both collect and deliver your car to its chosen destination. Just fill out the form and we will come straight back to you. 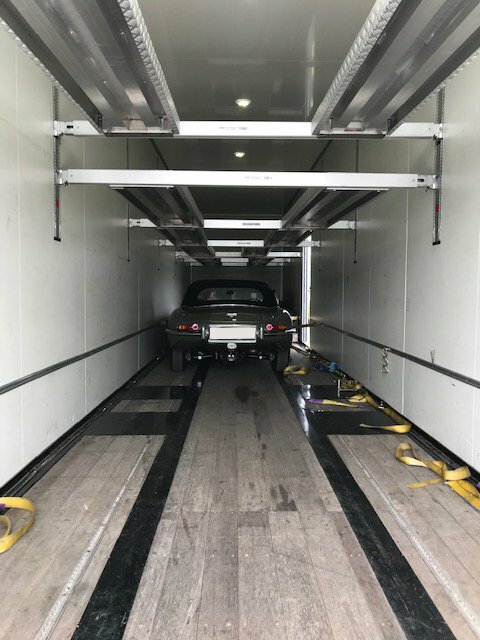 @Circuit2Circuit -We transported this beautiful old car into secure #CarStorage last week... but can you tell what it is?